Temple Baptist Church | Gospel. Community. Mission. Temple is multi-generational church united to make disciples who love the Gospel, are connected in Community, and live out God’s Mission. We believe that the Gospel is really good news! Everything we do is shaped by the Gospel—the good news of what God has accomplished through Jesus–in His life, death, & resurrection–to secure forgiveness of sins & life for all who will repent of their sin and believe in Jesus as Lord. We believe the gospel isn’t just the good news that saves us but transforms us everyday. As the heartbeat of Temple, you’ll hear us talk about the gospel a lot. We need each other! That’s because we are made for community. We are made in the image of triune God who has eternally existed in community. We know that gospel growth will only happen in a community of believers who pray together, love one another, and spur one another on deeper in the gospel. At Temple, we believe the church is just a place but a people who are connected by doing life together. We’d love to have you as part of our community. We have been rescued & redeemed by a loving and missionary God. Therefore, we seek to join Him in His mission by making disciples among all nations and loving our neighbors with the love of Christ. At Temple, we believe that every Christian is a full-time missionary called to serve wherever God has placed them. Therefore we seek to train, equip, and send our people to be a blessing to our city, community, and crafts. Easter is a time for celebration! 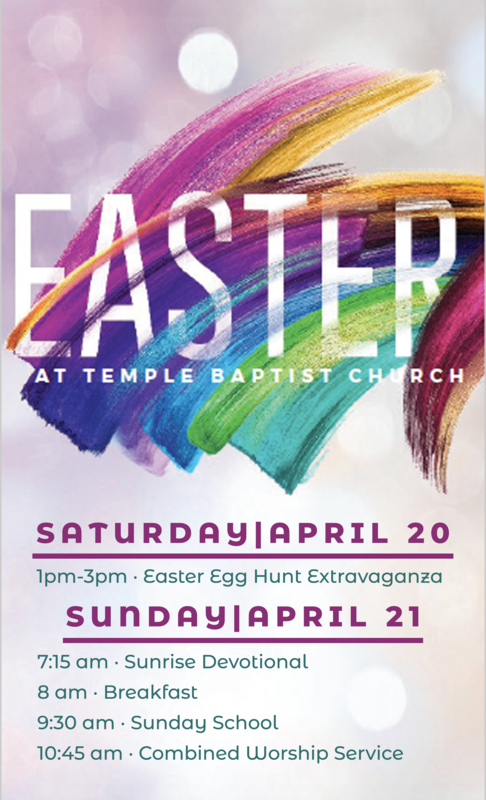 Jesus is alive and we want to invite you and your family to celebrate with us at two very special events designed for the whole family! The first is a community wide Easter Egg Hunt Extravaganza at Edison Park from 1-3 PM where we will have age-graded Easter Egg hunts, games, bounce houses, & face painting! The egg hunts will begin at 2 PM. The second is that we will be celebrating Easter in a special family friendly service at 10:45 AM in the CLC. We know that visiting a new church can be really hard! We want your experience to be as stress-free as possible. Find out what to expect when you visit Temple! We can’t wait to meet you and hear your story.